摘要 对中小水库型饮用水水源地生态安全评价进行了研究。构建了4个层次的安全评价指标体系，考虑了影响水源地水质、水量的内外各种因素，如人口密度、森林覆盖率等。通过数据归一化处理和权重分析，计算了指标的安全性指数值以判断安全度。生态安全评价体系应用于天台县桐坑溪水库饮用水水源地，结果表明指标层中污染防治和环境管理能力是影响该水源地安全的敏感指标，这两项的安全度分别为差和中等。由此提出近期水源地环境保护中应采取的对策和措施。 The ecological security assessment of medium and small drinking water source reservoirs was studied. Considering the intemal and external factors affecting the water quantity and quality of the source area, which include population density and forest cover, a four-layer security assessment indicator system was developed. The security index was calculated through normalization and weighting analyses of data. Using Tongkengxi Reservoir of Tiantai County, Zhejiang Province as an example, we fmd that two indicators, the prevention and treatment of pollution and the capacity of environmental management, have low and moderate security indices, respectively. 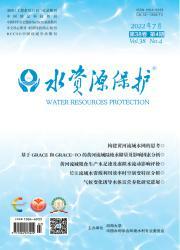 Current methods for protection of the water source area are put forward. 4research on methods of ecological security assessment of the middle and lower reaches of liaohe river based on gis[J].中国人口．资源与环境：英文版,2005(4):20-25.